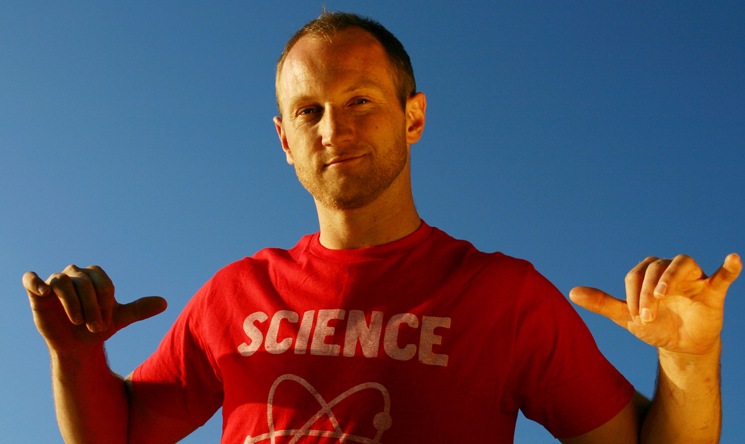 Debunking Christianity: Interview with Baba Brinkman (evolutionary rapper extraordinaire)! Interview with Baba Brinkman (evolutionary rapper extraordinaire)! To date Baba has written or co-written five hip-hop theatre shows, including The Canterbury Tales Remixed, The Rap Guide to Evolution, and The Rebel Cell, with MC Dizraeli. He won three awards and entertained thousands while performing six full seasons at the Edinburgh Fringe Festival. Baba is also the founder of Lit Fuse Records, which represents Aaron Nazrul and the Boom Booms, Smoky Tiger, and Mud Sun, as well as his own music. Besides executive producing and developing new talent through his label, Baba has recorded and released seven solo albums since 2004. 1) Why do you think there is a need for you doing the work you do? I tend to think more in terms of individual demand than societal need when it comes to the arts, but then I'm a capitalist at heart. I think people feel both the narrower desire and the more general need to support what I do because the forces of ignorance are still powerful out there, which creates great potential for satire and thus an entertainment niche, and at the same time people tend to support the kinds of things they want to see more of in the world. Of course, some aspects of the science vs religion/ideology debates are reducible to academic gamesmanship, but wherever there are real world consequences I think people tend to recognize that more knowledge is usually a good thing. 2) Do you think the scientific educational landscape in the States, particularly, is changing for better or for worse? How does Canada rate in comparison? From what I've read the US is still over 50% young earth creationist, whereas Canada is closer to 15%, but I wouldn't get too smug about Canada because I think a lot more of them would sign on to some form of "divinely guided evolution" which is no less unscientific. That said, more people than ever now self-identify as atheist/agnostic or non-religious in the US, so I think that bodes well for the future of science education. There's also a solid demographic shift going on, where younger people tend to be more open to science than their parents, so things will move ahead funeral by funeral as well. 3) Have you had any feedback from religious parents? I've had feedback – both positive and negative – from religious people, without stopping to ask whether or not they were parents, but I haven't had any outrage from parents specifically concerned about their children being corrupted if that's what you're asking. 4) You have mentioned in some of your live performances that you sit down and argue Creationism and Evolution with your extended family. Have you had any success in convincing those around you of the evidence and intellectual value involved with evolution? I don't think I've converted family members from hard-core creationism to the evolutionary perspective, but I've definitely emboldened some of the more reserved fence-sitters to take a stand and make their views known. Last year I got into an argument with one of my uncles over this and another uncle who usually stays out of the fray was spontaneously asked "well, what do you think?" and he paused for a moment and said to his brother "if you can get a chihuahua and a great dane from a wolf in a few tens of thousands of years, I think a lot of change is possible, more than you think." That's progress. 5) Have you ever had a public tête-à-tête with someone who denies evolution? If so, what was the outcome? I have had many, since The Rap Guide to Evolution usually ends with a question period that can turn into an opportunity for a member of the audience to vent at me. I've never had a staged one-on-one debate over evolution and creationism, but I'm not sure if I would sign up to that, maybe a rap battle though. It's usually an argument in the lobby after the show or an interaction from the stage with an audience member, and the outcome is usually that they are upset because I stand firm in support of two claims: the evidence base for creationism is nil, and the logical arguments in favour of it are bunk. You can hash out and debunk the logical arguments in a few minutes (thanks to Dawkins and several others who have provided me with the ammo on that) but as for the evidence base, those kinds of arguments tend to end with some kind of dispute over what's really out there, ie "transitional fossils" etc. So the last word is often "go see for yourself." Whether they do or not I can't say. 6) Which song are you most proud of and why? The one that tends to come up in conversation the most is "Performance, Feedback, Revision" which is not the catchiest of phrases at first glance, but once you've internalized it and thought about its applicability as a bridge from natural selection to human learning and the origins of culture, it starts to take on a larger-than-life significance. A guy emailed me a photo recently, which showed that he had "Performance Feedback Revision" tattooed on the back of his neck. I was pretty proud of that. 7) If you were to list the three best and most concise arguments for evolution, what would they be? 1) All the known physical evidence supports evolution. 2) The algorithm at the heart of the theory [variation + differential replication + heritability = change over time] is logically watertight. 3) All of the supposed moral hazards of accepting evolution such as "life will become meaningless" or "people will act like animals" are not only false, they are backwards. Comprehending evolution offers both sources of inspiration and opens paths towards a better world. 8) What can evolution tell us about morality, and what are your thoughts about the is-ought debate? Evolution can tell us where our moral instincts come from, the universal human emotions associated with guilt, outrage, shame, caring, pity, etc. It can also help us to understand the basis of some core moral dilemmas, such as the trade-offs involved in designing punishments that maximally deter bad behaviour without causing gratuitous harm. As for is-ought, I think Sam Harris is right that its invocation gives too much shelter to unfounded religious claims about morality, and if we can agree on some simple moral precepts (or perhaps just the one he proposes, "wellbeing"), then the distinction collapses. I agree that you don't automatically get an "ought" from an "is", but I think every claim about "ought" already relies on beliefs about what is, and what the consequences of one action or another will be, so in that sense facts do determine the difference between moral and immoral behaviour, since no value can be evaluated independently of the facts. 9) Why is evolution an important truth? All truths are important, but evolution is particularly important because it's about our story as a species, and each of our stories as individuals. It's the alternative to Sagan's "demon-haunted world" where mysterious forces impel us to act in destructive ways and we are blown about like leaves on the wind. Once you understand the evolutionary rationale behind your competing personal and social agendas, you can more easily choose among them in an intentional way. A quantitative answer would probably be self-defeating in this case so I'll go with a qualitative one. Yes, sometimes women hit on me after a performance, but don't forget mate selection goes both ways, and I'm far from indiscriminate. And from a Darwinian perspective it hasn't helped in the slightest, childless as I am. 11) You have had success funding your projects with Crowdfunder; why do you think this is? Because people have good taste and intelligence, not to mention goodwill and a desire to change their culture pro-actively. These things all act in my favour. 12) What would be your next scientific project? Would you take on climate skepticism? How about philosophy? I'm working on a proposal for a "Rap Guide to Medicine" and yes, I think climate change would be a great topic to tackle. I did the Rap Guide to Evolution on a shoestring and it has turned into quite a production, so I'm going through the grant-writing and investor-seeking process for the next projects so I can keep the quality high. Philosophy would definitely be of interest, yes, especially philosophy of science. Know anyone who wants to commission it? 13) Can evolution give a purpose to life or is that the realm of philosophy only? What is your purpose or meaning to life, as you see it? My purpose is to enrich and improve the lives of as many people as possible, starting with friends and family. Thanks to evolution I think I understand why I feel this way, but it isn't necessary to validate my feeling of purpose, which is first and foremost an emotional valence attached to a simple happiness-begets-happiness and misery-begets-misery observation. I see evolution as crucial to developing a good strategy and a decent comprehension of potential obstacles, but it doesn't give me a sense of purpose. More than anything it gives me a sense of perspective. I am the improbable product of many chance events, and my natural abilities were inherited from a continuous line of ancestors whose efforts crucially enabled my current range of possibilities. It would be a tragedy to squander that singular privilege. A huge thanks to Baba and the time and effort he has put in to answering these questions so thoughtfully and interestingly. Please check out his website and his great work.